Each year, Whisky Advocate Buying Guide reviewers collectively sample hundreds of whiskies. These include rare and extremely limited releases, as well as new and emerging labels that will find their way to shelves across the nation. To determine our Top 20, we begin by looking only at whiskies that rated "outstanding" (90 points or higher on Whisky Advocate's 100-point scale). 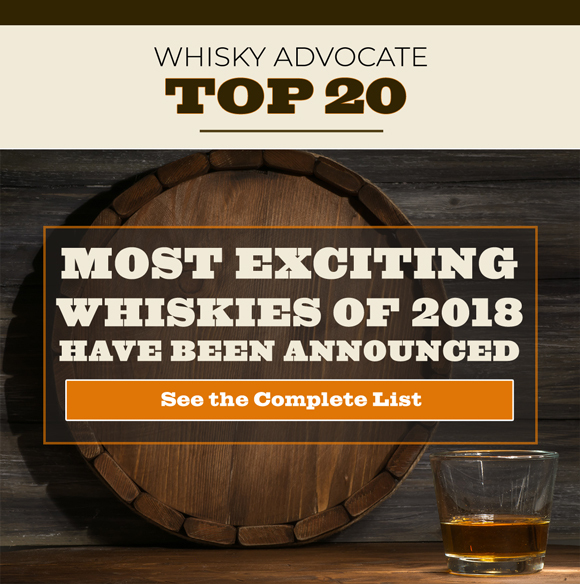 However, the Top 20 is not simply a collection of our highest-rated whiskies, because many of those are so limited they would be impossible for most readers to locate or purchase. Therefore, in addition to quality (based on score), our selection also prioritizes value (based on price) and availability. An important step in gauging the true merit of these whiskies is blind tasting review by a panel of international reviewers. The review panel tasted the eligible whiskies in a series of blind tasting flights to arrive at the final list. The panel did not know the identity of the whiskies being tasted—not their producer, country of origin, age, nor price. The average rating from the blind tasting panel supersedes the original Buying Guide rating. The individual reviewer rating will remain noted in the Buying Guide for the record. The final decision for placement considers average score, price, and availability. Our Top 20 is a selection of whiskies worthy of your attention. The list includes great values that might otherwise be overlooked, whiskies that are best in class for their style, and highly accomplished bottles you should be looking for. Most importantly, each of these whiskies generates excitement and marks a highlight across a year of tasting.